Part of the fun of wargaming, is choosing your models. I don't always have the free time to paint, so browsing mini manufacturer websites is often all the fun I'm having. I enjoy picking out a mix of the best-looking models for my units. There is an immense selection of ancient miniatures available for waging Warhammer Ancient Battles, and to play Song of Blades and Heroes you can grab any odd fantasy minis from your collection. What I don't like are rules that demand the purchase of only specified models. Of course, this makes great sense from a business point of view. If rule set X has unique characters and units, then the players are forced to buy their models only from company X. These officially sanctioned models stifle the hobby's capacity for creativity. 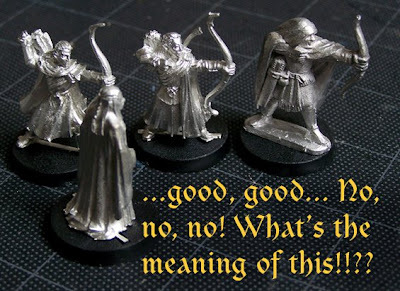 Stringent guidelines also exclude would-be gamers who simply don't like the official sculpts. For instance, I've been very interested in GameWorkshop's Lord of the Rings game, but I prefer the hefty 28mm models made by other companies. Although my local hobby shop is not operated by GamesWorkshop, my non-GW models are not welcome at their game nights. If the shop stocked Vendel, Gripping Beast, and Mirliton models, then I would surely by them there. Yet, this will never happen. There's no local demand for these miniatures (apart from me), because GW has everyone convinced they are the only game in town. I have the same problem with FOW. I'm interested in the game, but I'd rather use 1/72 models (I hate painting 15mm!). In choosing miniatures it's sculpting quality, variety, and cost that come first with me. If the rules don't support that, then I'm left out. Am I the only one who is too picky to play with models I don't like? I wouldn't say that I'm too picky to play with miniatures I don't like but I definitely understand your issues. If a guy wants to come to my FOW game with an army of Old Glory 15mm, I'm not going to complain. If he shows up with 1/72 then we have an issue because the table/miniature scale is off. There is no sense in buying something you don't want. It may preclude you from getting in on the fun in some cases, but it's your time and money and you should spend it how you like. There is a flip side to this, however. If you are the sort who likes to use alternate miniatures I think you do need to be considerate of the fun that everyone else wants to have. 1) Make sure that they are okay with your use of alternate figures. 2) Make sure that if you are going to use alternate figures that they are at least appropriate figures. Nothing irks me more than somebody showing up with some sort of outlandish stand-in or totally inappropriate figs claiming they are his "such and such" army. I haven’t wargamed properly in years so I haven't been stuck in the "Buy our rules - Buy our models" marketing machine for a while. However I'm currently trying to talk my brother-in-law into picking a WW2 game to collect and play. We have yet to make a choice but I'm hoping we can find a game and scale that can be supported by a range of mini manufacturers rather than just one. In the past I have bought, and been bought, GW stuff but they do have tendency to charge hefty prices! It's worth keeping an eye on the 28mm/1/56th plastic market which has four main manufacturers. The figures have varying conversion possibilities (check out Wargames Factories new Numidians). That's what I need to do—get a friend to play at home (away from official rules). I don't want to be a complainer, I just wish it were easier for me to get a few games in. I should admit to myself that I am more of a collector/painter than a gamer. My exacting modeling/painting standards make that so difficult! I am having to realize that I may be transitioning from a wargamer to a wargames miniatures modeller/collector. My group seems to be pretty much fixated on playing board games of late. Easier for them set up and play. I'm unlikely to buy any GW minis, unless it's off of Ebay or something, simply because of the expense. I don't dislike their sculpts, just don't have that kind of cash. Also, while I understand the benefit of being able to assemble a model from parts to give it a distinctive touch, I prefer figures that can go straight on the table without a long assembly session. You buy what you want!